Although she’s opted for more subdued tones lately, Holly Willoughby shows she’s not shy of a splash of colour with her latest bold fashion choice. On Thursday’s (April 4) edition of This Morning, the 38-year-old wowed fans in a bright red skater dress from Oasis, complete with LK Bennett heels and a strong red lip. 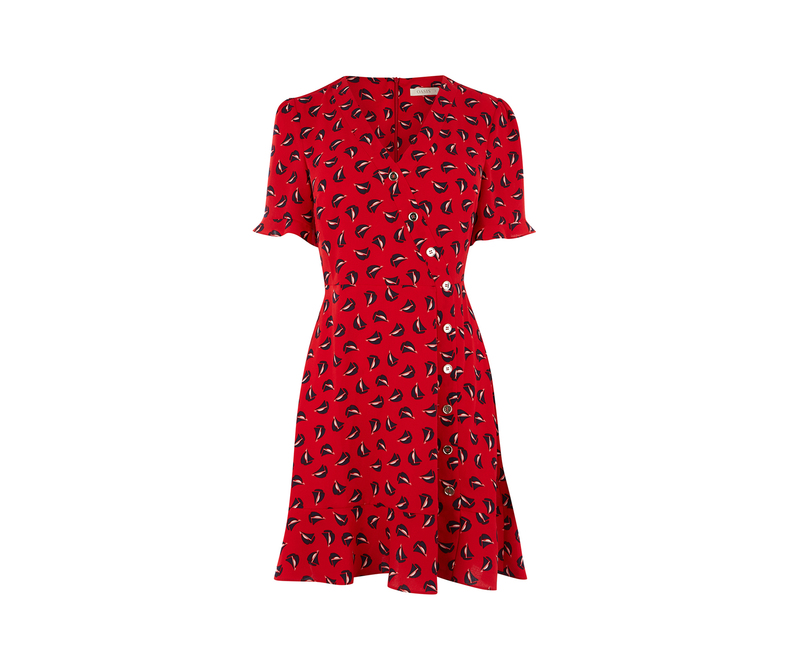 The Oasis Red Boat Print Skater Dress features asymmetric button detailing, a v-neckline and ruffled sleeves, which makes it the perfect addition to your wardrobe to see you through to summer. While the beginning of spring typically means the shops are awash with nautical Breton stripes, this adorable boat print is a playful take on one of the season’s best-loved trends. What’s more, the dress is one of Holly’s most affordable fashion picks yet. It costs only £46, although you’ll have to beat other shoppers to it as the dress is selling out fast! The Oasis Red Boat Print Skater Dress is available in limited numbers and sizes from both Oasis and Next, but we anticipate they won’t be around for long. Style yours with chic black heels and red lipstick like Holly, or opt for comfy black flats for a gorgeous daytime look.